Debbie Powell with her two bin and recycling collection day. A woman was left baffled after after she received two leaflets with different recycling days on. Debbie Powell, 56, from Luddenden Foot, said that around a year ago she had received a leaflet which said the recycling day was Wednesday. Then around two weeks ago, she says a new leaflet was pushed through the door saying the day was changing to a Monday. But earlier this week, Mrs Powell and other residents received a new leaflet, this time posted second class, saying recycling should be put out on the original day, Wednesday. She also said she was told that temporary staff had been taken on to mail leaflets out and answer queries. Anyone in any doubt about the day their waste and recycling is to be collected can find out online at www.calderdale.gov.uk/recycling. 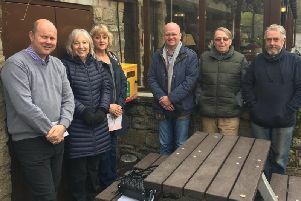 Councillor Barry Collins, Calderdale Council’s cabinet member for regeneration and economic development, added: “We are doing everything we can to make sure residents are prepared for the changes to their waste and recycling collections. What do you think? Please share your news and views with us at newsdesk@halifaxcourier.co.uk or via Twitter @HxCourier.